“Can you imagine browsing Facebook using any handset? Now You Can!” If you saw this in a teaser advert in today’s paper you must have been wondering (like we were) what sort of service this was and from which operator. We have just established from sources from Econet that this is their new product, Facebook on USSD which is set to be released any moment from now. This Facebook on USSD service has been launched in other countries like Nigeria, Rwanda, India and Pakistan through networks like MTN. With this new service any handset can be used to access the social network by dialing *325# The service which is being targeted mainly at Econet’s prepaid customers is meant as a “Facebooking” option for subscribers who do not have data enabled devices, are sensitive to the high costs of data or access internet service at restricted times of the day only( The workplace WiFi users). Log In to the service is through USSD or SMS. Via USSD the user dials *325# and is given access to a log in (registration for users new to Facebook) followed by the main menu for Facebook with 7 options. The subscriber then selects the option they want to access. In the case of SMS login a user sends a text message that reads FBID name@emailadd.com to 263325. This is followed by a response text with FBPWD #pass123. So how much will it cost? Well when a subscriber tries to access the menu options they are given subscription plans which are 10 cents, 50 cents and $1.50 for the daily, weekly and monthly subscriptions. This service feels a lot like an improved version of the eTxT service that Econet launched some years ago. 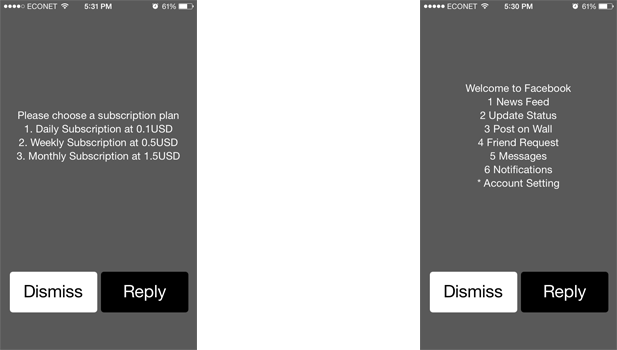 Though eTXT has been overshadowed by broadband services like WhatsApp it looks like Econet is keen on keeping it and SMS related services alive. Karbonn Titanium Octane Plus, does bigger mean better? If you have used this, does it send SMS alerts when someone sends a message, posts on a wall etc. Thats the only reason I would add this. So I am not constantly logging into FB to check! I dont like the emails because they email everything, but an SMS to say new message from XXXX or so and so wrote yyy on your wall. That would be ideal. and the fees are peanuts! True that will be a superb feature. I would start using bookface right away. Econet!!!! Are you listening lol. Awesome, that’s the way to go Econet. Soon we gonna here that the laggards have launched there’s also. An incomplete article as Techzim norm. How does one deregister this nonsense by the way?